When Leslie Freilich’s name was changed by a Tibetan lama to Rinchen-Wongmo it was not done to deny her past but rather to catalyze a spirituality that she had been seeking. This Tibetan name means Precious Empowered Woman and reflects Leslie’s embrace of life and the philosophy of Buddhism. She creates thangkas, vibrantly colored, meticulously sewn, sacred fabric scrolls that act as objects for meditation, for contemplation. 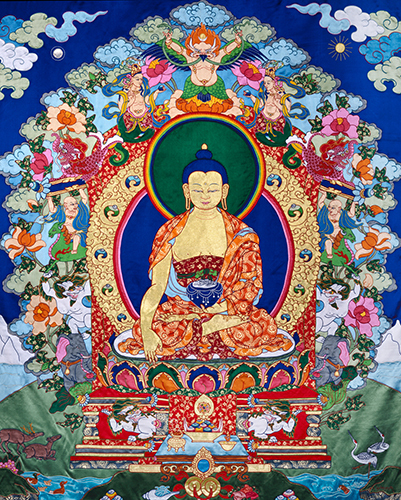 Creating a thangka (sounds like Tonka) involves techniques that are centuries old and a keen understanding of and appreciation for spiritual tradition. Over the years Leslie’s style has morphed from creating very traditional scrolls to a more modern, personal style that evokes both the ancient art form and modern quilting techniques. Whether ancient or modern, however, all of her art is infused with joy and serenity. Leslie has combined this ancient, spiritual art form with modern technology to create what she calls a “virtual atelier,” where she teaches people around the world via cyber space. Leslie says of her work: “I love that the images I create with my hands have helped many very special people to become free of suffering. I hope that in my small way I can open people’s hearts, that I can provide some stimulus or inspiration for their awakening.” Leslie’s work is collected and exhibited world-wide. Rinchen-Wongmo’s documentation was sponsored by Linda Carson and Michael Rohde. The AfterGlow was hosted by Paula Spellman. The FOTM Archive contains extensive information about this artist.